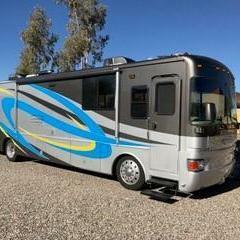 We have a Jayco Fierenza 2002. We have a television in the bedroom and one overhead in the driver area. We have a ROKU HDMI adapter we use at home because we have poor reception and don't want to spend a fortune on extra cable channels. We want to take the ROKU with us when we travel and use with the tv in the motorhome. However, they don't have a HDMI port. So we think we can change out one of the tv's for a newer one with the port. Does anyone have experience with this type of upgrade and what we should look for when buying a new tv? Size is probably the main issue. Most led thin tvs will have the sound coming out the bottom, difficult to hear. Since the newer tvs have a much smaller frame the width is usually the limiting factor which will leave room for a 24-30” sound bar mounted below the tv. I just installed a 32” Samsung with a Viso sound bar. We have a direcTV receiver, blueray dvd player and over the air tv antenna. To connect to the TV direcTV receiver uses 3 composite video cables. The blueray uses hdmi, and sound bar uses optical. The only problem I have so far is that the universal remote doesn’t control the sound bar. Until I resolve which setup code to use, I have to use 2 remotes, but it is the best TV and sound we have had in a coach. I have a 43 inch 4K Vizio in the front with Directv HD receiver hooked up with hdmi and a sound bar and sub woofer. Optical cable on the sound and hdmi on the blue ray player. My remote controls both the tv and the sound bar. The 4K picture seems to make a regular high definition picture a little better. With the proper source it has 4 times the resolution of standard HD. We have a roof-mounted OTA antenna, and in most places can get enough channels to satisfy. We also carry a few DVDs in case we need. Our TV is a Samsung and has Google and other apps built in, and when we're near enough to wifi to get reception it's possible to use those features. We have a wifi extender and when we can get a good wifi signal we've use our wireless network to connect all the devices like the TV to the signal. If you are going to get a new TV, you can probably find one with many of the features found in Roku built right into the TV. Ask for a smart TV and you'll find all kinds of apps and Roku-like things ready to go. Ross or DD, where do these connect on the TV? I need one for the front LED TV. All connections are on the back of the TV. 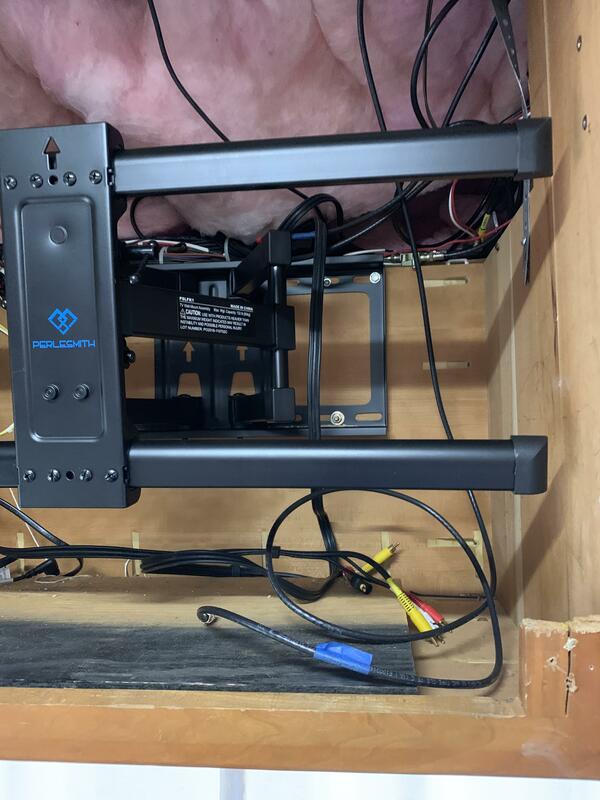 I made my own mount out of aluminum angle so that I can tilt the TV up and place a cross stick to keep TV up to expose the connections. I should have taken pictures when I was installing. I would have to remove the outside frame and the sound bar to tilt to be able to do pictures now. Just not into that right now. Just finished pulling a 65 foot cable under the coach for the rear view monitor. Now need to fix leveling jacks control on non rainy days. Ross, thanks! Ill look into purchasing one, last trip to Walmart they only had giant ones that were much too large. Many of the older MH's had RCA (red/white connectors) connectors as audio output and they provided the audio to surround sound, etc. The newer televisions only use HDMI (With ARC), Optical, and Coax audio and are not compatible with the earlier audio devices that use the BOMB input/output system (BOMB = Box Of Many Buttons). As stated, the speakers are either on the side or on the bottom behind the frame of the TV. Enclosed in a box will produce a muffled sound without an external sound device, like the soundbar as mentioned. A little modification to where the present TV is located and a full articulating TV mount can be installed. With this mount the TV can be larger than the opening and when not in use pressed flat against the cabinetry with consideration for the height. Measure, measure, measure! Also with the TV outside the cabinet any speakers side/bottom will be audible. 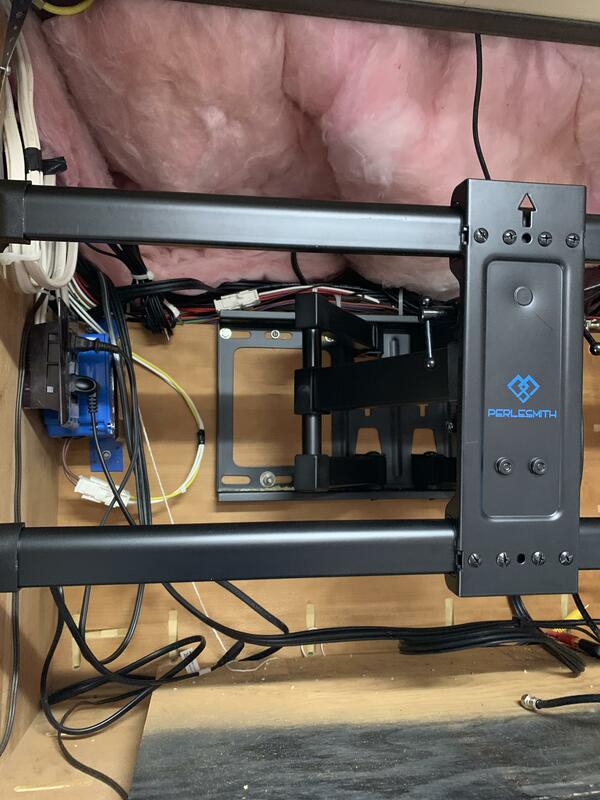 The full articulating arm configuration also allows easy access to the connections on the back of the TV. You will have to secure it with a strap or other device when traveling. I'll leave that up to your imagination. Your present TV most likely has a frame of an inch or more. The newer TV's have 1/4 inch or less on some models. If you do decide to recess it into the present hole just measure and find a TV that will fit in there. The actual screen size of the newer TV will be slightly bigger than your present one. Don't just go into a place to buy one that says 19" or 20" or whatever inch as those measurements are from diagonal corner to corner. Measure top to bottom and side to side for the recess mount. On the adapter power, don't worry about USB power as a USB phone charger plug will work. We replaced and older CRT with a flatscreen several years back on a 5th wheel. 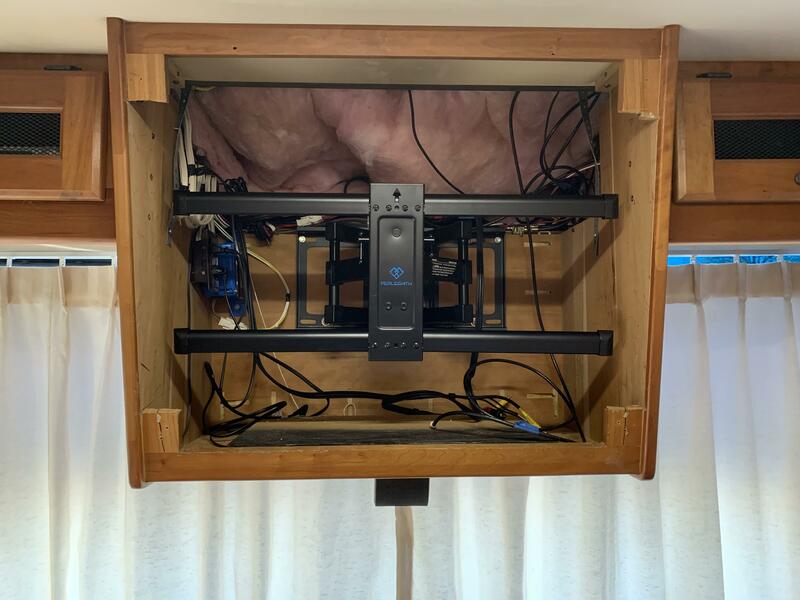 The hardest part was building a mounting bracket/brace as I did not want to support the TV and bracket off the trailer wall. I use an optical cable from the optical out on the tv to the optical in on the sound bar. My tv is hinged at the top so I put a shelf in the existing cabinet to hold my printer and other stuff. Both Dish Network and Direct TV have RV service plans. Take your choice which one you would like to have. You can turn either one on and off when you travel. Check to see which one suits your needs. I don't know about Direct, but Dish has a pay-as-you-go service where you can shut the service off for the months you are not using it. If you activate it for 1 day it is pay for the full month. I have the same TV and system as DD69. I think the only difference is sound. I run either thru the TV or when watching a movie, I have surround sound via the Samsung Blue Ray. When I bought coach, I had all the factory speakers replaced. My current TV and set up, along with DIRECTV was done last October. Everything runs off the same remote! If you have dish or direct, they both will allow you to use another receiver that can be mounted in the coach or trailer for a small fee per month, or you can simply move the house receiver to your rv when you leave home. Both have lite plans for $29.95 per month. Revisiting this topic. I am adding a soundbar to the front TV in our coach and I am looking for mounting suggestions. 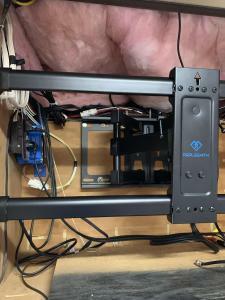 I was going to recess it above the TV but realized the soundbar exhausts sound from the sides and bottom, so if I mount it in the cabinet with the TV it will not be much better that what I have now. I am considering building a shelf above the TV and anchoring it to the shelf and I have considered building a shelf under the TV where the current surround sound speaker sits. Any thoughts, photos or suggestions on what others have done? P.S. I moved this post to the Modification section from General. My old tv was mounted in a box like yours. The new & bigger Vizio is external of the box, a 4" x 1/4" x length of cabinet, steel plate was used for mounting. Bottom & side sound bars are open...the Geek also connected my coach radio speakers, to the Blue Ray DVD player for surround sound, great for movies! Carl, ours is also connected to the Surround sound, but it works independent of the TV (old Sony system, no Blue Ray, just CD/DVD) which unless settling down for a good movie it becomes a hassle. I can set up the Sound bar to come on and off with the TV and control it from the same remote which made it very desirable and appealing to add one. I am considering making a wood shelf to mount under the existing TV cabinet for the sound bar to rest upon (anchored of course). If I put it on top it would need to be mounted upside down as there is a sub woofer on the bottom that I don't want exposed. Mine is independent of the TV also, via BR. If your TV fits inside the box, or tight against the box cut out...take a jig saw and open up an inch +/- under TV? Well there you go, I hadn't thought of doing that! I might have to raise the TV up to clear the speaker, which shouldn't be an issue. The fillers above and below the TV I made when I swapped out the CRT to the LED. Ill have to pull the TV and peek in the box to see what I have to work with, been a while since I was in there.